One of the largest members of the Cyclopteridae family of lumpﬁsh and snailﬁsh, the unusual-looking lumpfish is not a quarry of anglers, but it is known as a food fish in Europe and is reportedly valued for its eggs as an inexpensive substitute for caviar. The lumpfish is a stout-bodied, almost round ﬁsh, with a humped upper profile. It has a warty appearance, due to a ridge of prominent tubercles running along the middle of the back, as well as three other rows of tubercles on the sides, the uppermost of which extends from the tip of the snout to the base of the tail. Another distinctive feature is the way the pelvic ﬁns are fused to form a round suction disk, which enables the lumpfish to attach itself to rocks. Of variable coloration, it is usually olive green or bluish-gray with a yellowish belly; this grows red on males during breeding. The pectoral fins are broad and fanlike, and lower rays start at the throat region. The first dorsal fin is apparent only in the young. The lumpﬁsh can grow to 2 feet and 21 pounds, although it is usually smaller. Female lumpﬁsh may lay 20,000 eggs or more, which sink to the bottom and stick. They are guarded by the male until they hatch. Lumpﬁsh are solitary, rather than schooling, ﬁsh. The lumpﬁsh feeds on small crustaceans and small ﬁsh. 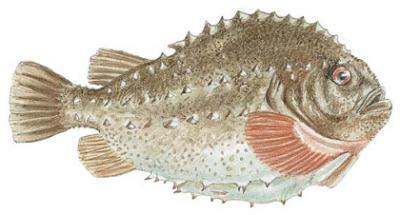 lump, lumpsucker, nipisa, kiark-varrey; Italian: ciclottero; Spanish: cicloptero. In the western Atlantic, lumpﬁsh occur from Hudson Bay to James Bay and from Labrador to New Jersey; they are rarely found from the Chesapeake Bay south or in Bermuda. Lumpﬁsh generally inhabit rocky bottoms of cold waters but may also occur among ﬂoating seaweed. 0 Response to "Lumpfish (Cyclopterus lumpus)"